Kingsford Charcoal and Current, its PR agency, ran a campaign that centered on tailgate parties to encourage consumers to continue grilling through football season. 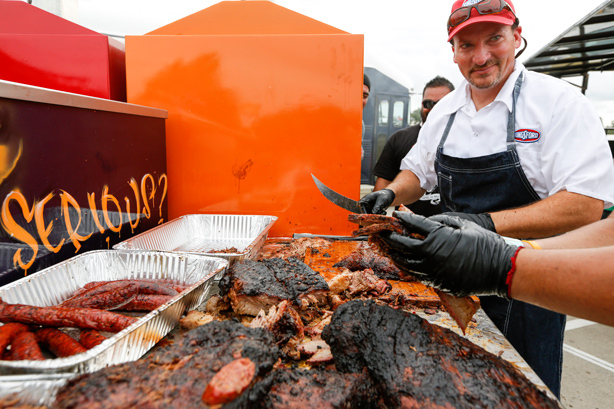 World champion pitmaster Chris Lilly grilled food for more than 150 people. Kingsford Charcoal and Current, its PR AOR, ran a campaign that centered on tailgate parties to encourage consumers to continue grilling through football season. "People like to get together, grill, and watch a football game," says David Kargas, associate director of PR and digital marketing at The Clorox Company, parent organization of Kingsford. "We’ve been running tailgate efforts for the last few years to extend the grilling season." This year’s campaign was tied to a donation to the Folds of Honor Foundation, which provides scholarships and other educational needs assistance to the children and spouses of military members who were killed or disabled during active duty. "The cause is important to our employees and customers," Kargas says. "It’s a great fit for this campaign because active-duty military members really miss getting together with friends and family. So when people get together to grill and watch a game, they can spend a moment honoring military members unable to join them." Awareness for the campaign was driven through media relations, Kingsford’s online channels, and paid partnerships with ESPN and Crowdtap, a vendor that connects brands with social media influencers. "The smell of burning coals is one of the biggest motivators for grilling," Kargas explains. "We believe the social version of that is people sharing photos or writing posts about their grilling experience, and we wanted to encourage that behavior." ESPN college football analyst Kirk Herbstreit and world champion pitmaster Chris Lilly, a longtime Kingsford spokesperson, spread the word that Kingsford would donate $1 (up to $50,000) to the nonprofit for every tweet containing #TailgateForOurTroops and for each purchase of Folds of Honor-branded charcoal. Kingsford provided a grilled meal for more than 150 military active-duty members, veterans, and their families during an August 30 tailgate at the University of Wisconsin and Louisiana State University football game in Houston, Texas. Lilly and Folds of Honor ambassador Diane Nemecek spoke before the game and gave interviews. Through Crowdtap, the team connected with more than 1,000 grilling enthusiasts who hosted tailgate parties across the US on August 30 and shared their experiences on social media channels with #TailgateForOurTroops. All Crowdtap participants received a Kingsford-branded apron, cookbook, and gift card for grilling supplies. On Saturday game days through November, Herbstreit encouraged his Twitter followers to leverage #TailgateForOurTroops in their tweets. Folds of Honor also regularly tweeted about the campaign. Further messaging was posted to Kingsford’s Facebook page, its Twitter handle, and to the brand’s website. As college football conference games were hitting full swing at the end of September, Herbstreit delivered messaging in a series of interviews on sports radio stations. The ESPN partnership also included a custom wrap featuring #TailgateForOurTroops on 3,850 copies of the November 10 issue of ESPN The Magazine, which were sent out to military members and bases. A full-page ad ran in the remaining 2 million-plus copies of the publication. Kargas reports that the campaign contributed to a 9% year-over-year growth in volume shipment for August to October and a dollar sales increase of more than 3%. The $50,000 fundraising cap was met. The hashtag #TailgateForOurTroops was used 10,140 times, garnering 5.5 million social media impressions. Twelve earned media stories ran in outlets such as SiriusXM and ABC Sports. Kargas says upcoming plans include social and traditional media outreach tied to real-time weather reports. PRWeek’s View: The overall concept of extending the summer grilling season into fall football season get-togethers is certainly beneficial for this brand, as sales and social media results illustrate. Linking last year’s campaign to a cause that is important to Kingsford employees and customers was smart, as was tying the donation to social engagement and product purchases. This was a nicely integrated and aligned campaign on all fronts.